We’re all familiar with the phrase “Tidy office, tidy mind,” and it actually tends to be true. As you set out to tackle projects, deadlines and items on your to-do list in your home office, a clean, polished workspace can only improve your productivity. Getting rid of the clutter can alleviate anxious feelings, too, so you can focus on your work instead of cleaning. To prevent clutter from building up and to keep everything in its place, it can help to have some organizational systems before you even sit down at your desk. Whether it’s a file cabinet, baskets or an incredibly brilliant way to organize that you’ve never considered, these ideas will inspire you to organize your home office once and for all. It’ll make you feel a lot calmer and ready to tackle any project that comes your way. When you set out to organize your office, there’s one spot where you should start—your desk. It’s the place that’s within eyeshot as you’re working, and you’ll feel a lot better if it’s looking organized. The best way to achieve that is to purchase a variety of desk accessories that are not only visually-pleasing, but also serve a practical purpose. In this office belonging to Kristin of Fancy Things, the desk is outfitted with a cup for pens, a charging station and a box with sticky notes. Shelves are quick and easy to bring into your office, providing much-needed spots to stash things if you don’t have a closet or drawers. In this office made over by designer Joanna Whittaker of Whittaker Interiors, the white shelves look chic and offer spots to store magazines, books and even a houseplant or two. Sure, we all probably have calendars on our computers complete with pop-up reminders, but there’s something to be said for also tracking your schedule on real, live calendars that hang in your office. In her office, Melissa George of Polished Habitat developed a three-month dry erase calendar system that’s equally decorative and handy. It sits alongside a shelf that holds plenty of office must-haves as well. 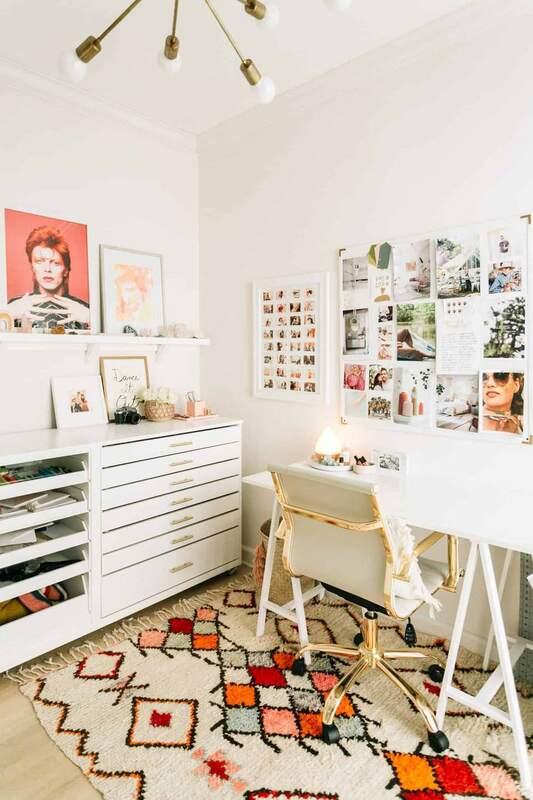 Jessi Russell is a senior stylist for Stella & Dot, so she naturally needs lots of room to store her inventory and other essentials in her home office. By bringing in classic shelving featuring numerous cubbies, she can organize and display her wares and do it stylishly. If you have enough room in your office, opt for a shelf with cubbies to truly achieve your organization goals. Elsie of A Beautiful Mess is a pro when it comes to creating a home office that’s not only on-trend, but is also flawlessly organized. Here, her yarn and crafting supplies serve as colorful décor when they’re displayed out in the open, while her other office essentials can be neatly tucked away in tons of white storage bins. With bins, you can bring this same level of organization to your own office, and bonus points if you also label the bins. Although it might feel a bit old-school, a file for your desk is a no-brainer way to hide all of those papers that are lingering around your workspace. In this minimal-chic office belonging to Teri of The Lovely Drawer, a white desk file matches up perfectly with the white desk and geometric artwork, and it serves as a hiding place for all those papers. Yes, you can totally bring together organization and décor. There’s nothing that says that you can’t make organization look pretty, which is proven in Diana’s office of 204 Park. On a shelf in the corner, her books are spotlighted alongside decorative objects like vases and gemstones, playing nicely with the rest of the décor in the feminine office. Your magazines, books, clippings and random pieces of paper can all come together to act as inspiration in your office, and you can give them places to live as well. Interior designer Vanessa Francis set up her home office to be practical and inspiring, with its built-in shelving for books and magazines and inspiration board that sits right behind her computer, ready to inspire her no matter what she’s working on. Plus, that light fixture is pretty amazing. If you have a spacious office and a budget to work with, consider bringing in a bank of cabinets to greatly improve your organization. In this hip office belonging to Nikki Mihalik of Akula Kreative and designed by Caroline Cressey of Rookery Design, white cabinets keep items out of the limelight while other office essentials are displayed in plain sight up above in clear bins. A command center near your entryway or in your kitchen is incredibly convenient, and you can bring that same convenience into your office as well. Create a “battle station” that includes your printer, a corkboard, files and a calendar and consider this to be your base of operations in your office. Pavan of Interior Love Affair crafted just such an area in her own home office, and made it look stylish and beautiful, too.